1 How Much Is a Single Serving Size of a Drink? 2 How Much Beer Should I Buy for a Group of 50 Adults? Hosting a party can involve many variables including the number of guests, type of party and the menu. When determining servings sizes for catering, a combination of simple calculations and understanding the drinking and eating behavior of the guests are helpful in developing a plan of action for how much food and drink to serve. Determining how many drinks to prepare will be based on the number of guests, how long the party will last, what type of liquor will be served and the age of the guests. For cocktail parties, estimate two drinks per person for the first hour of the party; one drink per person for each additional hour. For dinner parties, estimate two glasses of wine with dinner. If you plan to serve liquor, wine and beer, estimate that 30 percent of your guests will consume liquor; 60 percent will consume wine and 10 percent will consume beer. For parties serving only liquor and wine, estimate 35 percent and 65 percent, respectively. For parties offering a full range of beverages, estimate your guests will consume drinks with vodka 40 percent of the time, whiskey 20 percent, scotch at 15 percent, gin at 10 percent, rum for 10 percent and 5 percent tequila. If your crowd is younger, plan on beer and wines as the popular choices. If your crowd is older, liquor and wines are preferred. For parties with children attending, reduce the alcohol consumption by 20 percent. Common mixers and garnishes for drinks include orange juice, soda, tonic, ginger ale, cola, tomato juice, Tabasco, lemons, limes, horseradish and Worcestershire sauce. Estimate guests will consume an average of five hors d'oeuvres per person for the first two hours and three per person for each additional hour. Reduce the number of hors d'oeuvres by 10 percent if dinner is served at the party. Calculate approximately one plate of food plus 30 percent extra per course. Adjust food quantities based on the age of the crowd. If the guest list includes families with children, increase the food quantities by an additional 10 percent. Estimate side dish consumption at one gallon per 10 people or approximately 120 servings for 100 guests. The estimate is based on all side dishes served, not for each individual side dish. For self service or buffet settings, add an additional 10 percent. Allot for twice as many glasses on hand as guests. Estimate one-half to one pound of ice per guest. Allow for more ice if frozen drinks will be served. If hiring servers for a party, the amount of staff is based on the guest count and type of party. For a buffet style party, estimate one staff member per 20 to 25 guests. For a buffet seated style party, estimate one server per 15 to 20 guests. For plated, sit-down parties, estimate one server per 10 guests. The same ratios apply when hiring bartenders. Labor costs can run to $25 or more an hour. The staff is usually required to work a minimum number of hours. To reduce beverage costs, consider having a party with a theme and offering a maximum of two types of drinks. Also, consider the dietary needs of your guests with allergies, kosher or vegetarian requirements. Sit-down dinner parties allow for a more accurate allocation of food if you are working with a strict budget because food is served on a per plate basis. 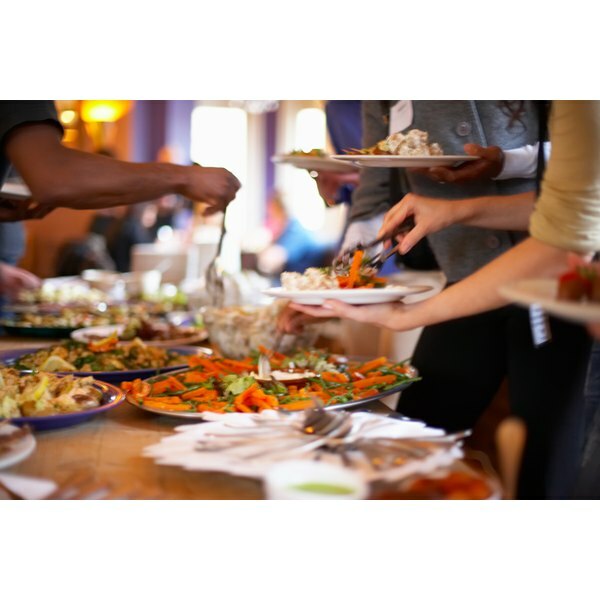 Self-serve or buffet-style parties can increase the food consumption by as much as one third because guests will serve themselves bigger portions. Have coffee and other nonalcoholic beverages available to guests and provide information for taxi services. What Is the Average Cost of an Open Bar at a Wedding? What Is the Cost of a Mexican Wedding?